The second of our picks of the year. Earlier today we each chose our Backbencher of 2008. Jonathan Isaby’s pick: My choice for frontbencher of the year will come as no surprise to anyone who read this piece – in which I wrote about the man in question a little over a month ago. 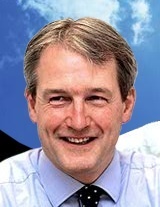 As Shadow Secretary of State for Northern Ireland, Owen Paterson would not expect to enjoy the highest of media profiles, but he deserves this accolade in recognition of all the work he has put in this year towards creating a new political force in Northern Ireland through an alliance between the Conservative Party and the Ulster Unionists. He quietly beavered away on the project for most of the year, spending at least one day a week in the province, and the deal was finally sealed in mid-November. Owen should rightly feel proud of this achievement. Tim Montgomerie’s pick: Hardworking. Friendly. A master of his brief. Always in the media. The opposite of the Tory stereotype. The public face of a great team. I am, of course, talking about Eric Pickles MP. After his role in the Crewe and Nantwich by-election campaign – following a successful masterminding of our local government advances – Eric shot to near the top of our regular shadow cabinet league table of members’ satisfaction. 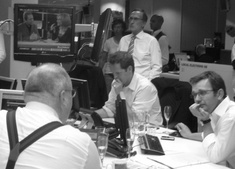 These memorable images captured his ‘maestro’ role on local elections night 2008. Some jealous Cameroons briefed against him but he has deservedly retained the affection of colleagues and members. My hope is that he’ll become Party Chairman in 2009.
Who is your Frontbencher of the Year?